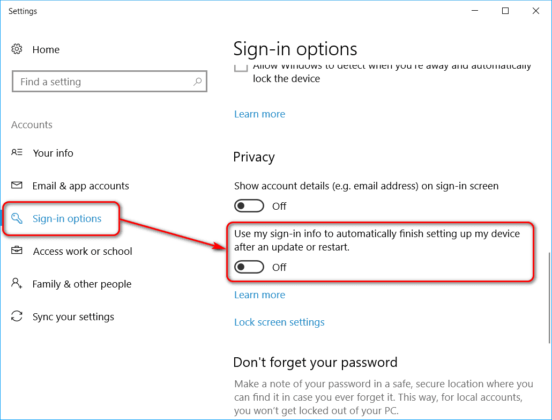 Some users have recently reported that they have to login twice after restarting or shutting down a machine running on Windows 10 Fall Creators Update. After entering the Windows password, they subsequently get redirected back to the Windows 10 Welcome screen prompting to enter the credentials again. This turns out to be a new Microsoft bug which occurs on Windows 10 Creators Update specifically after restarting or shutting down a machine. Please keep in mind that you or your clients may experience this issue following the update. Click the Start button, then select Settings > Accounts > Sign-in options. In the Privacy section, turn off Use my sign in info to automatically finish setting up my device after an update or restart. You can easily connect using FixMe.IT to make the necessary adjustments on a remote client’s machine. Our team has conducted in-depth testing to ensure that FixMe.IT is fully compatible with the Windows 10 Fall Creators Update, so rest assured that everything works exactly as it should. Join us on Facebook, Twitter, or LinkedIn to get all the latest tips, news and product updates as they happen.